Migration is really underway now! We have been lucky with some noteworthy sightings in Bryant Park this spring (such as the Chuck-will's-widow on our very first walk of the season, and later a Green Heron, both firsts for the park). But overall things have been a bit slow: a long and cold winter led to delayed budding and flowering plants, which in turn leads to later hatching of caterpillars and other insects that many migratory species of birds (warblers, vireos, tanagers, cuckoos, etc) rely on for food. Several horticulturists told me that trees and other plants were about two weeks behind schedule this spring, and that seems to be the case for the birds as well. But they seem to be making up for lost time: an incredible 30 species of warbler were seen in Manhattan on Monday and Tuesday! The lack of food isn't the only thing that affects the timing of birds' migration. A more important factor, perhaps, is the presence of favorable winds. Birds migrate when there are tailwinds (in the case of a northward spring migration, winds from the south). If they have a headwind, it could slow them down to the point where their ground speed is effectively zero, and no use burning all those calories to make no progress (I examined all of this in detail in a blog post two years ago). 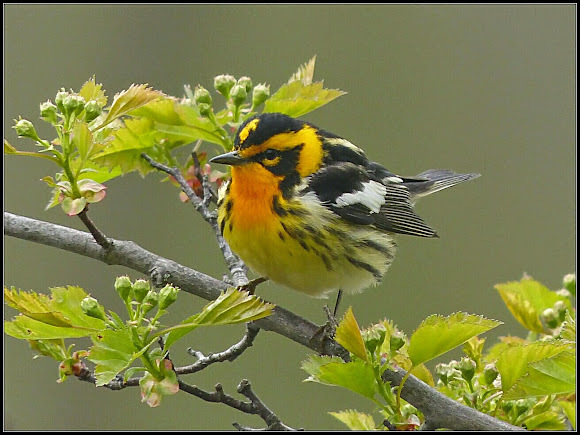 Blackburnian Warbler by Ken Mattison. Until this past Sunday, we had a persistent high-pressure system and cold winds from the North-West. This was just about the worst conditions for birds migrating north in the spring. But as the week began, this system finally broke, bringing warm southern breezes and 80-degree days. For most people this meant t-shirts, picnics, iced coffee. For birders it meant time to grab the binoculars! The migrating birds had presumably been biding their time somewhere to the south of the cold front, like a passenger at the airport with a flight delay, checking the time and munching on caterpillars (the birds, not the hypothetical airline passenger). Then as soon as the winds changed they all appeared, and the newly leafed-out trees were alive with song and color. Their flights ultimately arrived from the northern foothills of the Andes (Blackburnian Warbler), from the West Indies (Cape May Warbler), from Mexico and Central America (Baltimore Oriole), and from the rain forests of Amazonia (Eastern Kingbird). It's easy to forget that "our" birds spend a good part of the year far away, in a completely different landscape and ecosystem, and might even have completely different behavior when there. The aforementioned kingbird is a highly territorial insect-catcher on its North American breeding grounds, but a flocking jungle treetop fruit-eater in the winter. One has to crane one's neck and endure "warbler neck" to glimpse Blackburnian Warblers in the treetop canopy during migration or or the dense spruce trees of their breeding grounds to the north, but on their wintering grounds in Colombia, Ecuador, and Peru, they seem to be in every shrub and bush in the cloud-forest understory. They survive unthinkable odds to fly over such vast distances every spring and fall, through storms, over oceans, to return to the same stopover spots and little breeding territories and wintering territories. Many species breed and winter on the same territory of a few square yards or a few acres year after year. 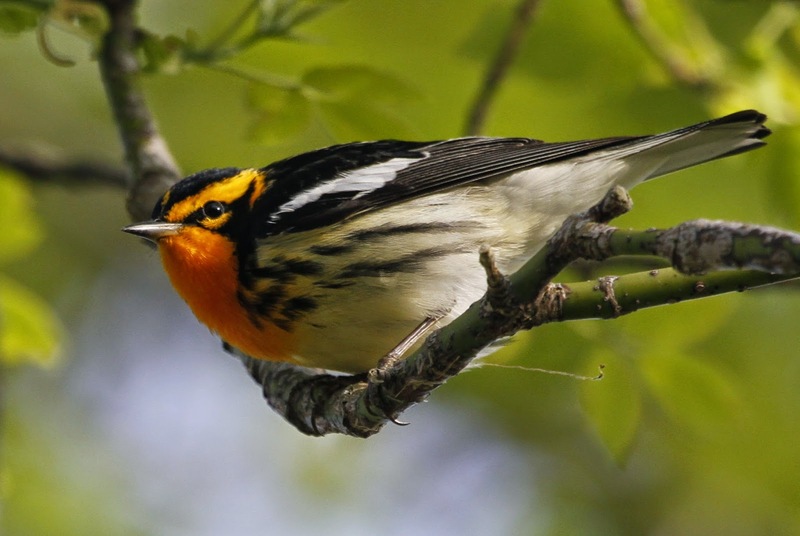 Blackburnian Warbler by Paul Hurtado. Let's revisit our Blackburnian Warbler, a tiny bird weighing about ten grams, or as much as a pair of nickels. They may be tiny, but the male is resplendent in bold patterns of black, white, and flaming orange (the female is more subdued in coloration, and just as small). Let's say one of these flame-throated little wonders raises a brood of young somewhere in the vast boreal forests of Canada, and returns to its patch of winter land in a Ecuadorian cloud forest, only to find it gone, cut down for cattle grazing or cleared to make way for a copper mine in the Intag Valley, what then? Where will it go? It will presumably be forced to crowd into the remaining suitable habitat, and end up competing for food with its warbler neighbors; survival will be that much more of a challenge. Similar challenges may face the warbler upon its arrival in its breeding grounds to the north, where pesticide spraying to control Spruce Budworms can reduce their food supply, and thousands of acres of spruce and fir are clearcut to make paper towels, toilet paper, and other products. But for now, our warbler survived all of this, and answered the instinctual call to fly north once again, to sing his squeaky song and build a little nest of roots, grasses, and spiderwebs. En route, it flies over a great metropolis, a confusing canyon of bright lights, reflective glass, and hard concrete. It spots a little patch of green, and lands to rest and search for some bugs in the canopy of the columns of London Plane Trees that line this park. Keep looking up, and perhaps you'll spot the first one to be recorded in Bryant Park. Although 118 species of birds have been seen in Bryant Park, and Blackburnian Warblers are frequently seen around NYC parks during migration, one has yet to be spotted in Bryant Park! Maybe we'll be the first to see it on one of the Bryant Park bird walks?